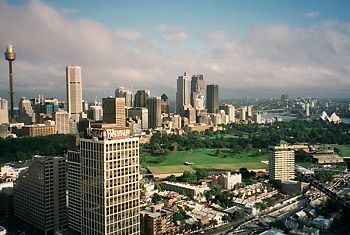 Better Bonsai: "Procumbens Nana: Different Direction Down Under"
For three years, my husband worked in Sydney, Australia. The bad news: we lived in an apartment with a balcony too small to accommodate bonsai. The good news: the balcony had a view. The better news: Australians are wonderful people and I made many new friends – including Megumi and Brian Bennett, owners of Imperial Bonsai Nursery on the north side of Sydney. 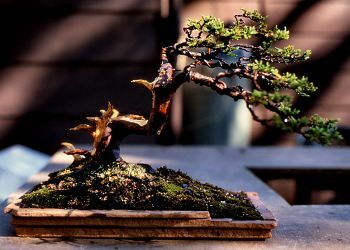 Megumi was gracious enough to invite me to style one of her trees for a local demo. This procumbens nana was very healthy. The base of the trunk had nice size and taper. Obvious problems included a 90º bend to the right, no discernible taper from that point, and a wide, U-shaped turn of the trunk back over itself. All remaining branches were leggy and at about the same level, creating a long and low canopy. The pot was entirely too large and needed to be addressed once the tree was restyled. The challenge was to minimize the unfortunate trunk line while calling attention to the base of the trunk. By turning the tree about 40º clockwise, the length of the horizontal trunk was shortened. Carving taper and movement made the ugly, leggy branches more interesting. Your eye was now attracted to the contrast between the jun and the lifeline, which was one of the nicest features of this tree. Because the natural flow of the lower branch was to the right (as is the trunkline), the top branches were wired in the same direction to harmonize with the rest of the tree. The more branching we removed, the larger the pot became. The tree needed a shallow pot, either rectangular or oval. 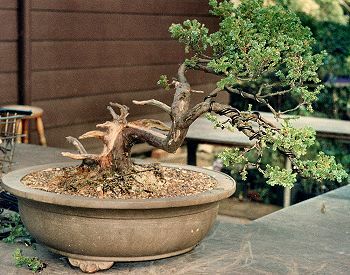 With the flow of the tree to the right, the tree needed to be planted on the left side of the pot to create a feeling of stability. The tree upon completion. All branches were positioned in the windswept style. The trunk now had interesting movement leading to the branches. The jin was a nice contrast to the branches. The handmade sandstone pot was a much better size and shape for the new design. The right side of the pot, which resembled steps, mimicked the movement of the trunk. The strong lines of the trunk were reflected in the straight lines of the pot, yet the delicate feel of the thin trunk was matched by the thin layers of sandstone. Lastly, the burgundy color of the bark blended harmoniously with the pale rose hues of the sandstone. In the future, as the branches develop, the jin should extend to the top branch. A jinned apex flowing off to the right (following the green branches) would be aesthetically pleasing. Jinning the apex also would make it possible to carve out the reverse taper where the trunk splits into two branches – and that would eliminate the last obvious flaw. 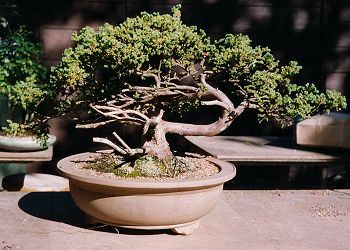 This article has also appeared in Bonsai: Journal of the American Bonsai Society.